At Experimac Tulsa we specialize in Apple® computer repairs and upgrades. Although in most cases, products are not considered vintage until they are more than 20 years old which is not the case with Mac® computers. In the world of Mac computers, products more than 5 years old are considered vintage and considered obsolete by those at the Apple Inc. store. Experimac Tulsa will even work on your vintage Mac computer. If your Apple computer is running slow or is low on storage, we know what to do to get it working to your standards. 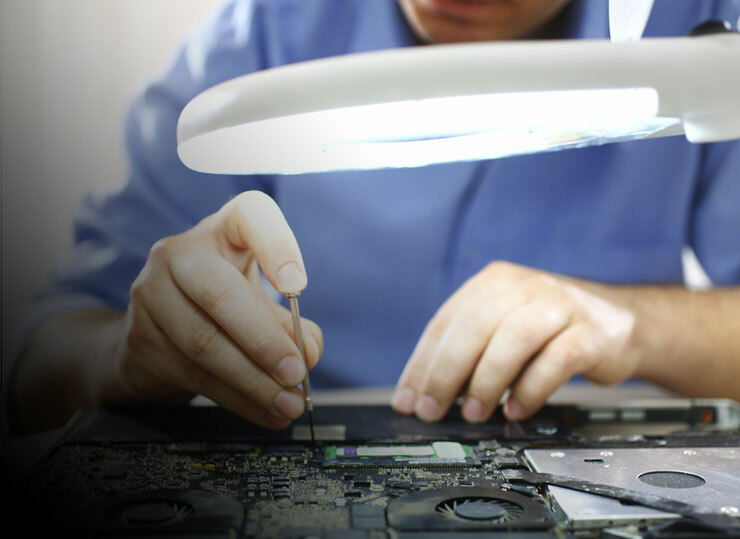 If your iMac® computer has recently stopped functioning due to a faulty logic board or even just a broken fan, our team of professional technicians can bring your machine back to life quickly whether it’s vintage or not. We understand that upgrades and repairs are necessary from time to time but rest assured, we use high quality hardware to ensure a long life into the future for your treasured Mac computer. Having a large inventory of parts is a priority for Experimac so that your repairs can happen as quickly as possible. 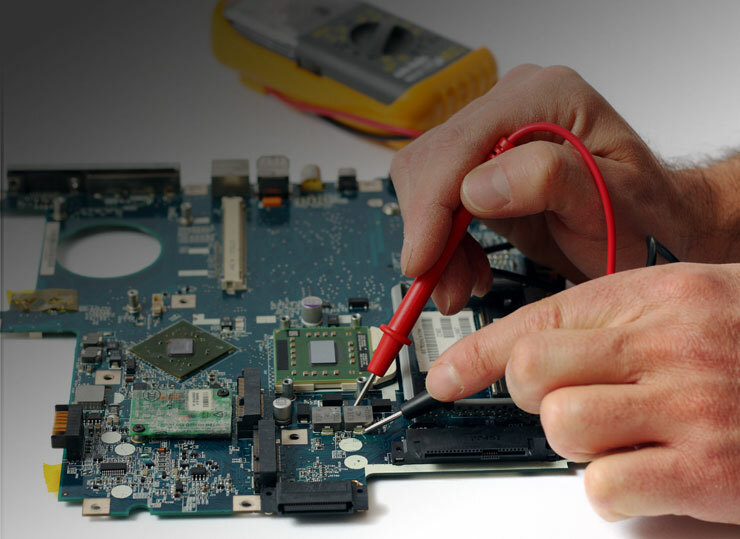 There is no better computer repair service in Tulsa than Experimac because our trustworthy technicians are extensively trained on iMac computer hardware and software. Our team knows how to get inside your iMac computer without damaging the shell and even though Apple Inc. has designed some newer products in a way that make it difficult to get in there, we know how to do it. The goal is always to bring you the best possible service. Whether you use your computer to design websites, play video games, write award-winning novels, or edit photos of your adventures here in Tulsa, we know how important your Mac computer is to you. Experimac offers a 90-day warranty on all repairs so you can rest assured not matter how big or small your repair or upgrade is. You can trust Experimac Tulsa with all of your computer repairs and upgrades. Bring your Mac computer in today for a free estimate. We look forward to working with you! At Experimac West Hempstead we specialize in Apple® computer repairs and upgrades. Although in most cases, products are not considered vintage until they are more than 20 years old which is not the case with Mac® computers. In the world of Mac computers, products more than 5 years old are considered vintage and considered obsolete by those at the Apple Inc. store. Experimac West Hempstead will even work on your vintage Mac computer. If your Apple computer is running slow or is low on storage, we know what to do to get it working to your standards. If your iMac® computer has recently stopped functioning due to a faulty logic board or even just a broken fan, our team of professional technicians can bring your machine back to life quickly whether it’s vintage or not. We understand that upgrades and repairs are necessary from time to time but rest assured, we use high quality hardware to ensure a long life into the future for your treasured Mac computer. Having a large inventory of parts is a priority for Experimac so that your repairs can happen as quickly as possible. There is no better computer repair service in West Hempstead than Experimac because our trustworthy technicians are extensively trained on iMac computer hardware and software. Our team knows how to get inside your iMac computer without damaging the shell and even though Apple Inc. has designed some newer products in a way that make it difficult to get in there, we know how to do it. The goal is always to bring you the best possible service. Whether you use your computer to design websites, play video games, write award-winning novels, or edit photos of your adventures here in West Hempstead, we know how important your Mac computer is to you. Experimac offers a 90-day warranty on all repairs so you can rest assured not matter how big or small your repair or upgrade is. You can trust Experimac West Hempstead with all of your computer repairs and upgrades. Bring your Mac computer in today for a free estimate. We look forward to working with you! At Experimac Columbia we specialize in Apple® computer repairs and upgrades. Although in most cases, products are not considered vintage until they are more than 20 years old which is not the case with Mac® computers. In the world of Mac computers, products more than 5 years old are considered vintage and considered obsolete by those at the Apple Inc. store. Experimac Columbia will even work on your vintage Mac computer. If your Apple computer is running slow or is low on storage, we know what to do to get it working to your standards. If your iMac® computer has recently stopped functioning due to a faulty logic board or even just a broken fan, our team of professional technicians can bring your machine back to life quickly whether it’s vintage or not. We understand that upgrades and repairs are necessary from time to time but rest assured, we use high quality hardware to ensure a long life into the future for your treasured Mac computer. Having a large inventory of parts is a priority for Experimac so that your repairs can happen as quickly as possible. There is no better computer repair service in Columbia than Experimac because our trustworthy technicians are extensively trained on iMac computer hardware and software. Our team knows how to get inside your iMac computer without damaging the shell and even though Apple Inc. has designed some newer products in a way that make it difficult to get in there, we know how to do it. The goal is always to bring you the best possible service. Whether you use your computer to design websites, play video games, write award-winning novels, or edit photos of your adventures here in Columbia, we know how important your Mac computer is to you. Experimac offers a 90-day warranty on all repairs so you can rest assured not matter how big or small your repair or upgrade is. You can trust Experimac Columbia with all of your computer repairs and upgrades. Bring your Mac computer in today for a free estimate. We look forward to working with you! If you’ve ever had your iMac freeze or if you’ve run out of storage space, you’ve experienced the frustration of where to go to repair your Apple computer. Maybe an Apple store is not nearby, or you can’t make a Genius Bar® appointment with them for two more days. Maybe you’re wary of second party retailers. That’s where Experimac Houston can help you. Experimac Houston offers repairs and upgrades for every computer, from your brand new iMac® computer to your vintage Mac® computer or Windows computer. Maybe your computer is running slow or has issues with internet connectivity, or maybe you aren’t sure why it is freezing. Bring your machine into Experimac Houston and we will conduct a thorough assessment to find out what is causing the issue. Our experts will offer suggestions and work with you to find the right solution for your machine. Whether it’s a larger hard drive, solid state storage, additional RAM, a new screen, or a new logic board, we stock only the highest quality products, so you can rest assured that we will get your machine running like new in no time. At Experimac Houston, we don’t just want to repair your computer, we want to make sure you are satisfied with our services as well. That’s why we offer a 90-day warranty; if something breaks, we will repair or replace the defective part at no cost to you. If you are in need of a computer repair, consider stopping by Experimac Houston today. You can count on our expert repair technicians to provide fast and quality repairs for your Apple or Windows machine! If you’ve ever had your iMac freeze or if you’ve run out of storage space, you’ve experienced the frustration of where to go to repair your Apple computer. Maybe an Apple store is not nearby, or you can’t make a Genius Bar® appointment with them for two more days. Maybe you’re wary of second party retailers. That’s where Experimac Middleton can help you. Experimac Middleton offers repairs and upgrades for every computer, from your brand new iMac® computer to your vintage Mac® computer or Windows computer. Maybe your computer is running slow or has issues with internet connectivity, or maybe you aren’t sure why it is freezing. Bring your machine into Experimac Middleton and we will conduct a thorough assessment to find out what is causing the issue. Our experts will offer suggestions and work with you to find the right solution for your machine. Whether it’s a larger hard drive, solid state storage, additional RAM, a new screen, or a new logic board, we stock only the highest quality products, so you can rest assured that we will get your machine running like new in no time. At Experimac Middleton, we don’t just want to repair your computer, we want to make sure you are satisfied with our services as well. That’s why we offer a 90-day warranty; if something breaks, we will repair or replace the defective part at no cost to you. If you are in need of a computer repair, consider stopping by Experimac Middleton today. You can count on our expert repair technicians to provide fast and quality repairs for your Apple or Windows machine! How is your Mac computer holding up? Only 10% of Apple® laptops break down within 3 years of purchase, according to the latest Consumer Reports survey. If you have chosen an Apple brand product, you have made a wise choice. Still, even with the outstanding rank of highest reliability, Apple computers and laptops benefit from upgrades and repairs over time. Experimac Fredericksburg wants to help you keep your Apple products in tip top condition. What’s wrong with my Mac computer? Diagnosing what’s wrong with your Mac computer can be stressful. The more you use your computer or laptop, the more likely it is to acquire problems. At Experimac Fredericksburg, we have an expert team of technicians who can help you solve them. Is your Mac computer not functioning properly? On average, Apple laptops are used more than other brands; an average 23 hours per week versus the average 20 per week for all other brand laptops. If you are a frequent laptop user, take caution and bring your computer to one of our locations. Whether you want to repair a damaged product or look into upgrading your Mac computer with the newest hardware – we stock the highest quality Apple parts in house. Specializing in computer and laptop repair services, Experimac Fredericksburg is fast, affordable and committed to helping you maintain your Mac products. We offer upgrades, including new batteries, faster RAM, increased space on your hard drive for photo and video storage and more. Since older and more frequently used computers and laptops have a higher failure rate, it is important to manage and monitor the upkeep of your device. It is true, Apple computers and laptops are proven to be less likely to break down than other brands, but when they do break down, the cost is higher to fix unless you know where to go. Here at Experimac Fredericksburg, we are committed to providing exceptional customer service and a 90-day warranty on all repairs. At Experimac Santa Ana we specialize in Apple® computer repairs and upgrades. Although in most cases, products are not considered vintage until they are more than 20 years old which is not the case with Mac® computers. In the world of Mac computers, products more than 5 years old are considered vintage and considered obsolete by those at the Apple Inc. store. Experimac Santa Ana will even work on your vintage Mac computer. If your Apple computer is running slow or is low on storage, we know what to do to get it working to your standards. If your iMac® computer has recently stopped functioning due to a faulty logic board or even just a broken fan, our team of professional technicians can bring your machine back to life quickly whether it’s vintage or not. We understand that upgrades and repairs are necessary from time to time but rest assured, we use high quality hardware to ensure a long life into the future for your treasured Mac computer. Having a large inventory of parts is a priority for Experimac so that your repairs can happen as quickly as possible. There is no better computer repair service in Santa Ana than Experimac because our trustworthy technicians are extensively trained on iMac computer hardware and software. Our team knows how to get inside your iMac computer without damaging the shell and even though Apple Inc. has designed some newer products in a way that make it difficult to get in there, we know how to do it. The goal is always to bring you the best possible service. Whether you use your computer to design websites, play video games, write award-winning novels, or edit photos of your adventures here in Santa Ana, we know how important your Mac computer is to you. Experimac offers a 90-day warranty on all repairs so you can rest assured not matter how big or small your repair or upgrade is. You can trust Experimac Santa Ana with all of your computer repairs and upgrades. Bring your Mac computer in today for a free estimate. We look forward to working with you! If you’ve ever had your iMac freeze or if you’ve run out of storage space, you’ve experienced the frustration of where to go to repair your Apple computer. Maybe an Apple store is not nearby, or you can’t make a Genius Bar® appointment with them for two more days. Maybe you’re wary of second party retailers. That’s where Experimac Suwanee can help you. Experimac Suwanee offers repairs and upgrades for every computer, from your brand new iMac® computer to your vintage Mac® computer or Windows computer. Maybe your computer is running slow or has issues with internet connectivity, or maybe you aren’t sure why it is freezing. Bring your machine into Experimac Suwanee and we will conduct a thorough assessment to find out what is causing the issue. Our experts will offer suggestions and work with you to find the right solution for your machine. Whether it’s a larger hard drive, solid state storage, additional RAM, a new screen, or a new logic board, we stock only the highest quality products, so you can rest assured that we will get your machine running like new in no time. At Experimac Suwanee, we don’t just want to repair your computer, we want to make sure you are satisfied with our services as well. That’s why we offer a 90-day warranty; if something breaks, we will repair or replace the defective part at no cost to you. 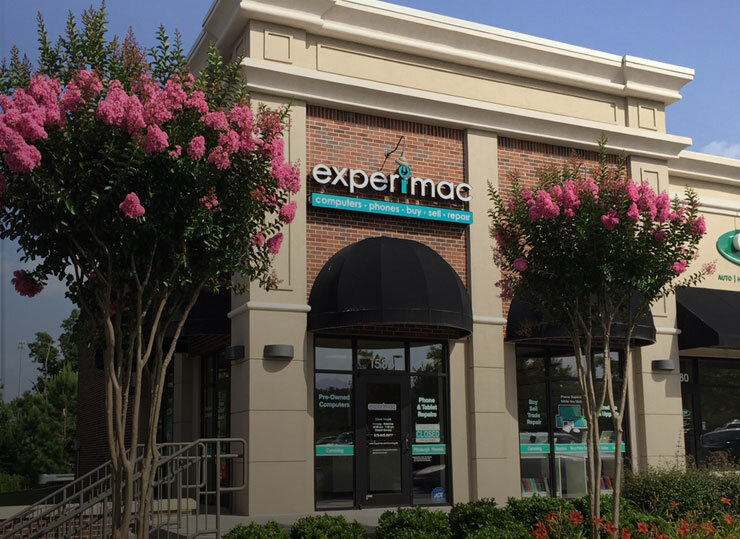 If you are in need of a computer repair, consider stopping by Experimac Suwanee today. You can count on our expert repair technicians to provide fast and quality repairs for your Apple or Windows machine! How is your Mac computer holding up? Only 10% of Apple® laptops break down within 3 years of purchase, according to the latest Consumer Reports survey. If you have chosen an Apple brand product, you have made a wise choice. Still, even with the outstanding rank of highest reliability, Apple computers and laptops benefit from upgrades and repairs over time. Experimac Middleton wants to help you keep your Apple products in tip top condition. Diagnosing what’s wrong with your Mac computer can be stressful. The more you use your computer or laptop, the more likely it is to acquire problems. At Experimac Middleton, we have an expert team of technicians who can help you solve them. Specializing in computer and laptop repair services, Experimac Middleton is fast, affordable and committed to helping you maintain your Mac products. We offer upgrades, including new batteries, faster RAM, increased space on your hard drive for photo and video storage and more. Since older and more frequently used computers and laptops have a higher failure rate, it is important to manage and monitor the upkeep of your device. It is true, Apple computers and laptops are proven to be less likely to break down than other brands, but when they do break down, the cost is higher to fix unless you know where to go. Here at Experimac Middleton, we are committed to providing exceptional customer service and a 90-day warranty on all repairs.